I love strawberries, but have always been a bit undecided about strawberry shortcake. For one thing, there just aren't enough strawberries in the dish. And where's the chocolate? 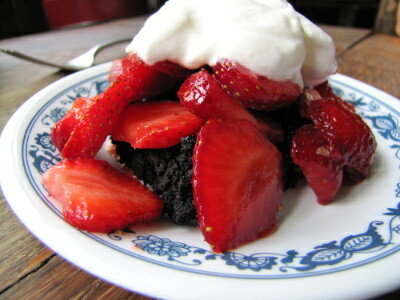 With strawberry season in full swing, I tested out a new recipe that won everyone's heart...including my own. Start with a big bowl of strawberries. 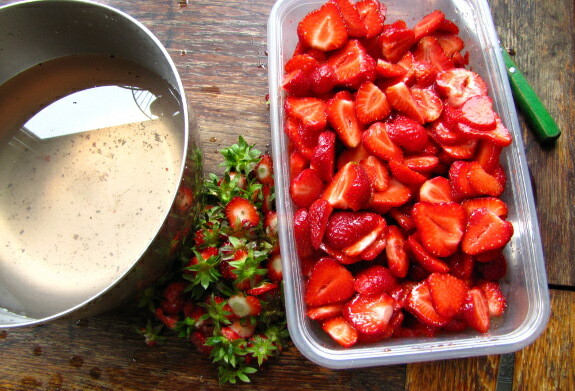 A gallon of strawberries will serve about seven or eight strawberry lovers. Try not to eat too many on the way into the house. 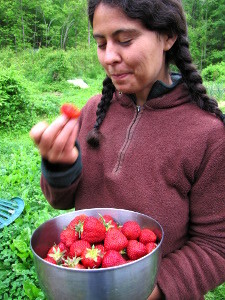 If you must, wash the strawberries, but only if it's been raining and the fruit is really dirty. Then cut off the stems and slice the berries into slivers. Sprinkle on a bit of sugar (perhaps 0.25 cups at the most) --- you shouldn't need much, but if you couldn't wait to pick the berries on a sunny afternoon, a bit of sugar will bring out the flavor. Stir up the berries and set them aside. You should have just over two quarts of lightly sweetened strawberry slices. Now make the brownies...I mean, shortcake. Preheat the oven to 350 degrees Fahrenheit and butter a 9 by 13 inch pan. Melt a stick of butter and stir in 1 cup of sugar, 2 eggs, 1.25 cups of cocoa (we used Hershey's Special Dark because it was on sale), 0.25 c. flour, 0.5 teaspoons salt, 0.5 teaspoons baking powder, 1.5 teaspoons vanilla, and about 2 tablespoons of water (enough to make the dough hang togeher.) Whir up one 3.52 ounce bar of 60% dark chocolate (we used Hershey's Extra Dark) in the food processor to turn it into chips. Stir the chips into the dough and spread the result into the bottom of the pan --- it won't want to spread and will be a bit thin. Bake until a butter knife barely comes out clean. Now, pour a pint of whipping cream in a bowl and turn your mixer on high to whip it. At the end, sprinkle in a bit of sugar (perhaps 3 or 4 tablespoons) and mix just enough to blend. Finally, assemble your dessert. 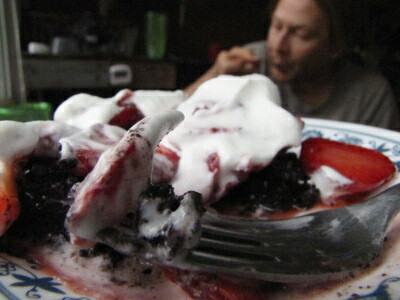 Brownies on the bottom, then strawberries (being sure to pour on some of the juices), and finally whipped cream. This recipe is too rich to eat every day, but is definitely a great way to celebrate the height of strawberry season. Heather deemed it worthy of a muddy trek through the alligator swamp...and she doesn't like homemade brownies! Don't your chickens deserve a treat too? Our chicken waterer gives them POOP-free water. How can anyone not like chocolate, especially dark chocolate? It must have been the whipped cream! Possibly the strawberries!!! Wish I had been there to help eat what sounds like the best possible dessert. You'll have to plan a trip down here sometime at the end of May and we'll treat you to a repeat! Just read your post on strawberry "shortcake" (cheater :-), and I thought I'd chime in with my absolute favorite new made up recipe: chocolate scones. I think they would go awesomely with strawberries. -Preheat over to 450 F. - Blend dry ingredients in a mixing bowl and rub in the butter. If you're feeling really decadent, toss in about 1 c mini chocolate chips. - In a small bowl, beat together egg and buttermilk. Make a well in the flour/butter mixture and pour in the liquid. Mix together for about 20 seconds. - Turn out dough onto a well-floured surface and dust the top with flour. Using a bench knife or bowl scraper, knead together gently about 10 times (don't get too tough with it, or they'll develop too much gluten and be tough back at ya :-). Pat the dough until it's about 1/2" thick (I usually make them a bit thicker -- up to you, just watch the baking time). - Cut out circles with a biscuit cutter (again, size is up to you, but the smaller, the shorter the baking time), pressing down firmly. Just like with biscuits, don't twist the cutter, or they won't rise to their fullest. - Bake for 12-15 min -- it's a bit tricky to tell doneness since they're so dark, but as long as they look firm, they should be fine. Even if they're a bit soft in the middle, I still like 'em. Depending on tastes, I found you can vary the amount of cocoa powder: when I first made them, I dumped a bit in, mixed, said, that's not dark enough, and dumped in more. So 1/2 c is kind of a guess. Anyway, these are pretty deep deep cocoa-y, such that I love 'em, and Steven's not crazy about them (he's a milk chocolate kind of guy). You'll need a bit more liquid -- but it's just like making biscuits. It also works really well to halve the recipe (just approximate half an egg :-). And see, I messed with a recipe, and it worked!!! I was so pleased with myself. Also, it's low in sugar. Also also, you could probably easily use half white whole wheat flour, since the chocolate is so predominant. Feel free to share, although the credit for the plain scone recipe is from King Arthur Flour (they rock). And please give Heather a biiiig hug for me!!!!! 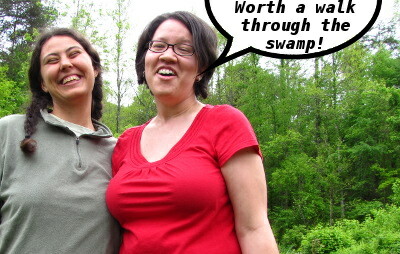 But you're right -- totally worth the walk through the swamp. Also, I'm not sure why I only have one eye open. I look like a pirate. Arrrrr!